CHAMPIONSHIPS HISTORY: Who’s the Best-Ever Runner-Up (And Beyond) In Each Championship Event? 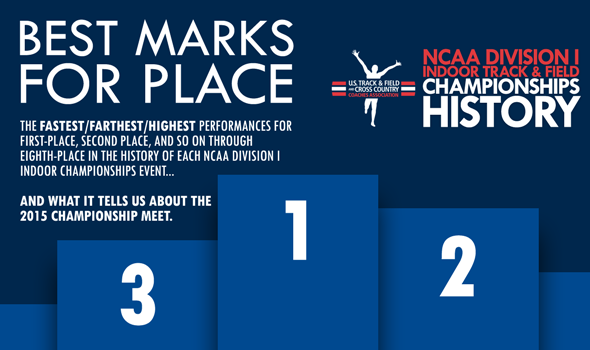 Of all the meet history reports in the USTFCCCA’s NCAA Division I Indoor Track & Field Championships History page launched Thursday – and there are a lot of in-depth reports – perhaps none tell the stories of each individual event’s greatest match-ups throughout the years better than the “Best Marks For Place” document. The concept is pretty simple: What is the meet’s all-time best time/mark score for first place? For second place? for third place and so on through eighth place? The answer to all of those questions for each event in meet history (even the defunct ones) can be found here. More than a window into the past, these lists can also be the lens through which we inspect the historic implications of future events. What do these lists tell us about what we can expect from NCAAs this year in terms of potential history? Never before in the 16-year history of the men’s 60 meters as a championship event have more than four men run 6.60 or faster in the same NCAA Championships final. Four men did it a year ago at altitude in New Mexico and four did it in 2012 in Nampa, Idaho. That’s it. Could each and every finalist this year go sub 6.60? It’s certainly a possibility as 13 of the 16 qualifiers have run 6.60 or quicker this year, with several having done it multiple times. Ole Miss’ Jalen Miller has done it eight times, Trayvon Bromell of Baylor and John Teeters of Oklahoma State have both done it six times, Ronnie Baker of TCU has gone that fast three times, and both Kendal Williams of Florida State and Tevin Hester of Clemson have two 6.60-or-faster times to their names. Perhaps the fastest final from top-to-bottom in meet history was that 2012 race in Nampa when the eighth-place final scorer came through in 6.65. That race accounts for the fastest finishing times in meet history from fourth place through eighth place. That could very well change by Saturday afternoon. Granted, the mile and other distance events have historically been events more predisposed to following the “sit-and-kick” formula more than others at this meet, but this year’s field is shaping up to be a special one if everyone challenges one another from the gun. Colleen Quigley of Florida State at 4:29.67 has already run faster than the meet record of 4:29.72 run by Tennessee’s Sarah Bowman in College Station, Texas in 2009. Of the seven women behind her, six have seed times that are superior to the fastest times run by second-through-eighth-place-finishers in meet history. The only exception? Arizona State’s Shelby Houlihan has run 4:30.77 this year for the No. 2 seed, which is just a second shy of Sally Kipyego’s best-ever runner-up time of 4:29.75 – just .03 off the meet record, but also just .03 shy of Bowman in that epic 2009 race. Could many of the key players (Quigley, Leah O’Connor of Michigan State, Sammy Silva of New Mexico, Stephanie Schappert and Angel Piccirillo of Villanova) be hampered by their inclusion in the previous day’s distance medley relay? Perhaps, but it’s worth noting that Bowman’s mile record came one day after anchoring Tennessee to the meet, collegiate and world record in the DMR with a 4:31 1600-meter split. From the men’s perspective, no men’s NCAA mile final has ever featured more than six sub-4:00 milers in the same race. Could this be the year all eight scorers break four minutes? All 16 finalists this year have gone sub-3:59 this year, but running those times in a championship event is another thing entirely. The last time six men got under four minutes was 2001 when sixth-place Jeremy Tolman of Weber State made it by the narrowest of margins in 3:59.99. Three more men nearly cracked that threshold that year, with all three missing out by less than two-thirds of a second. In what is the fastest 5k race in meet history from spots three through eight (the winners’ and runner-up’s times were eclipsed the following year by Lawi Lalang and Chris Derrick’s epic duel), four men ran faster than 13:30 and five more finished between 13:34.54 and 13:37.03. Fast forward to this year and only Eric Jenkins of Oregon has run faster than the ninth-place finisher in that race, Andrew Poore of Indiana. That’s not to say No. 2 Thomas Curtin of Virginia Tech, No. 3 Parker Stinson of Oregon and the rest of the field won’t rise to the challenge and go faster than their seeds.